As we continue on this month's journey with the series, "Relationship Enrichment, Marriage Rescue and Practical Principles for Healthy Living After Divorce," I am mindful that not everyone who may be reading the articles from this series are (a) married (b) happily married. You may have even gone through marriage before and are (a) divorced and (b) even contemplating divorce simple because, life didn't go the way that you had dreamed of. Nonetheless, I believe in the power of God and how He can turn sadness into joy, despair into hope, chaos and confusion into peace and divine order. I also believe that just as He created, He changes things, rules, reigns with His word, He has also created man as a "speaking spirit" to do the same. 1) I affirm that my spouse and I are of one mind, that we walk in unity and there is no division among us. I confess that we are also perfectly joined together, we walk in agreement and we have the same Spirit of God inside of us. 2) My spouse and I have love one for another. Our love is solidified in the faith and it is that same love that we share for one another that covers a multitude of faults and mistakes between us. 3) God's desire for us is that we prosper in all that we do, that we have a happy, healthy marriage that lasts us a lifetime, even as we prosper spiritually. 4) I confess the word of God over my marriage and call it blessed. I affirm there is no bitterness and strife between us, neither is there any anger, fussing, fighting, evil speaking, malice, or any ill-will towards each other. 5) I am my spouse's biggest encourager. The words that I speak daily to my spouse are the words that will build up and never to tear my spouse down. 6) I affirm that my spouse and I are kind towards one another, we are tenderhearted towards one another, we forgive one another, just as God has forgiven us through His Son Jesus Christ. 7) I affirm that I will not minimize or invalidate my spouse's feelings - that I will always try to understand and support my spouse's perspective even when my spouse's point of view is different from the one that I have. 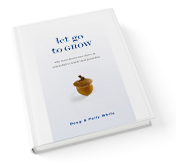 new book "Let Go To Grow"
8) I decree that according to God's word that no weapon that is formed against my marriage (spiritually or physically) shall be able to prosper against us in any way. Every word that is spoken against us shall fall to the ground and die and will not take root in our lives. unfaithfulness of any kind; and neither will we ever take any thoughts of separation or divorce. We will only take the thoughts of God towards one another of love, joy, peace, gentleness, goodness and meekness. 10) I affirm it is the Lord who has joined my spouse and I together in marriage. Therefore, since God has joined us together, I decree that no person, spirit, force or power shall be able to separate or divide us. 11) I confess that my spouse and I pray together each day, and that our love for each other is like a tree that is planted by the rivers of water, that bring forth blessed and prosperous fruit in its season. I just love this blog, and I'm really loving this post. Just by uttering these words, and acting upon them, we already make a difference in our relationship. Thanks for stopping by, I really appreciate your support and what you have done thus far to get the word out. Blessed are those whose feet carry the gospel and by that I call you blessed! In addition to what you have said, believing is key to this whole process. Many times persons would wait for trouble to step in to do something but having been married before, I think the confessions have to be often, as often as daily to fire proof our marriage. God bless you and your family! These are great affirmations and I definitely agree with the previous comment from Kalley C. In addition to speaking the words, one must believe as faith comes by hearing and hearing by the word, the process of healing and wholeness begins. Thanks for sharing! Something we can all benefit from. Hi Janelle, thanks for your input. You have mentioned a very relevant point about faith coming by hearing etc. Both faith and belief are interchangeable. The word of God deposited in our spirit bring about conception to what we just heard. Faith sustains the spiritual pregnancy (promise of God's plan) until it becomes reality in the earth realm in our lives. Blessings! Hi Myne, thanks for your support and encouragement. Your presence is always so refreshing and I am glad that you found the article very helpful. God bless you and your spouse with a long healthy, happy and prosperous life. I call you both blessed! Beautiful! Love this series! Thank you for allowing Him to use you to bless others! Thanks Michelle for your love, support & encouragement. God bless you and your spouse. May the bond of God love keep you knitted together as one for a lifetime. I call your union blessed! Wonderful affirmations!! it is amazing how powerful words are when spoken by the one you love to affirm truth. It truly brings strength to relationships and increases the love. Greatly appreciate your contribution. I am encouraged by it. Blessings! Hi thank you for taking the time out to visit my blog and to share from your own experience. I am happy to hear that you are at a place of calm - with dedication and a spirit of commitment each day, your marriage will last. I call your marriage blessed!